We lost an great leader in the Learning and Development community this weekend. His presence will be missed. But his impact will forever be felt by an industry struggling to see the future that appeared so clearly to him. 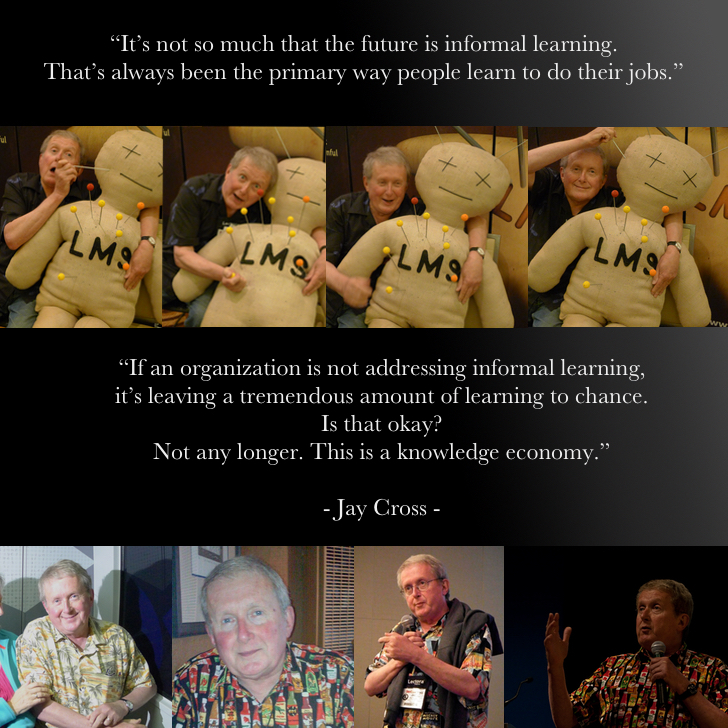 I will miss Jay's casual, yet driven, approach to spreading the word about informal learning...and that smile. Oh, and those shirts. They were the perfect informal vehicle for carrying his message of informal learning. His warm presence will be missed at industry events all over the world. We love you. Rest in peace, Jay. I am encouraging everyone in the industry whether you knew him or not, to record a short, "informal", video with a short story, or comment about Jay's impact on your work. I will be collecting and editing them together to be posted on the ITA website or other appropriate internet location. You can use wetransfer.com to send large video files. And send it to brentschlenker(at)gmail(dot)com.